Looking for an appetizer recipe your guests will love? Look no further! 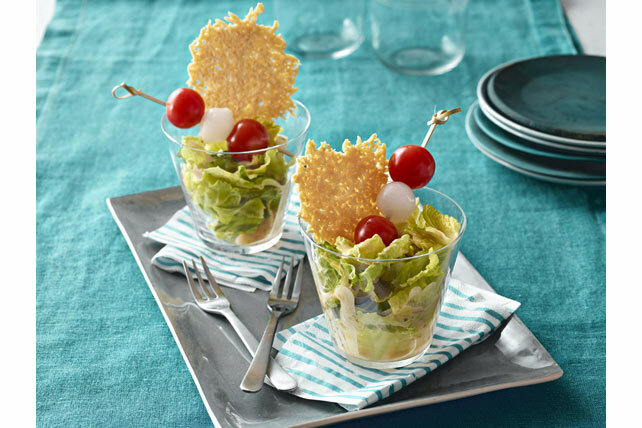 Our Caesar Salad Cocktail recipe is a fun twist on a traditional salad recipe that will wow your guests! Spoon cheese into 6 mounds, 3 inches apart, on baking sheet sprayed with cooking spray; flatten slightly. Bake 6 min. or golden brown, carefully turning after 5 min. Remove to wire racks; cool. Place lettuce in 6 (8-oz.) glasses. Thread 2 tomatoes and 1 onion alternately onto each of 6 skewers. Add to glasses. Drizzle with dressing. For best results, prepare in short glasses with wide-mouthed tops.